Is your business finding it hard to acquire the Facebook Likes and Shares you need? Are you stuck in a Facebook posting whirlpool, spinning around and never really getting anywhere? Every 60 seconds 293,000 Facebook posts are made on Facebook. I’ve analyzed posts from some of the top Facebook pages to show you how to stand out from the crowd and create awesome Facebook posts - including tips on what to do, what to test, and what to avoid. My search resulted in 11 examples of post strategies you can implement to boost your Facebook Page. I’ll also drop a couple top tips to keep in mind when using these strategies. People don’t read on Facebook. They skim. To maximize engagement with your posts you need to quickly and easily communicate how your Fans can participate. In this section we’ll see how some of the world’s most successful companies encouraged Fan participation and how you can too. A “Share” vs. “Like” post is a great way for people to engage with your brand by offering their opinion (which Facebook users love to do!). Basically, this post offers two different options. A person can “Like” the post to vote for option A or “Share” the post for option B. With this strategy, Walmart found a 650% increase in Facebook likes over more traditional ‘here’s a picture of some popcorn that’s on sale’ posts. 1. Easy Engagement: The post has two simple options that make it easy to engage. I also like the use of large, enticing images, making it easy for users to make the decision. 2. Seasonal Relevance: I love their choice of products. 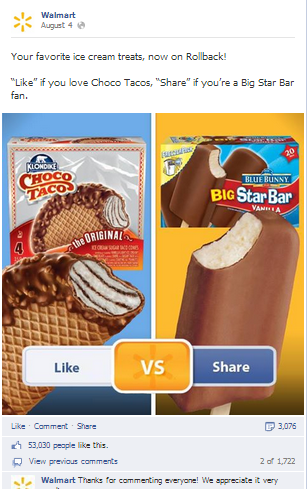 Using ice cream in the summer is a great example of tapping into what your Fans are already thinking about. 3. 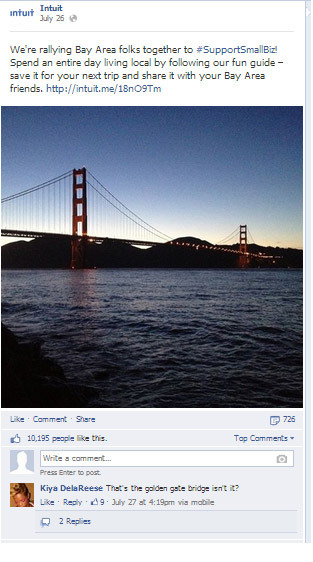 Re-Engagement: Seeing how the contest is running may drive Facebook users back to the page. Think of two similar products you sell that appeal to people with different tastes. They must be used for the same activity or in the same context. This forces people to make a choice (instead of saying they like both) and drive up the votes. Han Solo or Luke? Batman or Spiderman? Facebook or Twitter? Don't want to read this massive resource right now? Click here to download this article as a PDF and read it at your leisure! The poll is a simple but effective way to get your Fans to involve themselves in your brand. This post includes 2-4 options, and then asks Fans for their favorite. It’s also a great way to get some free market research! 1. Opinion polls: Facebook users love to share their opinion. The large image and four options make it fast and easy for them to understand the poll and do so. 2. The Call-to-Action: Instead of just a boring ‘Pick the one you like’, they use appealing language: ‘which flat is your favorite for fall?’ See below for some CTA suggestions. The Picture: I’d definitely test a more exciting picture for this poll post, with models instead of just the shoes on a table. How about the traditional ‘lady’s-night-out shoe shot’? While of course the online vote or opinion poll strategy is simpler for retailers, it’s not exclusively in their back pocket. 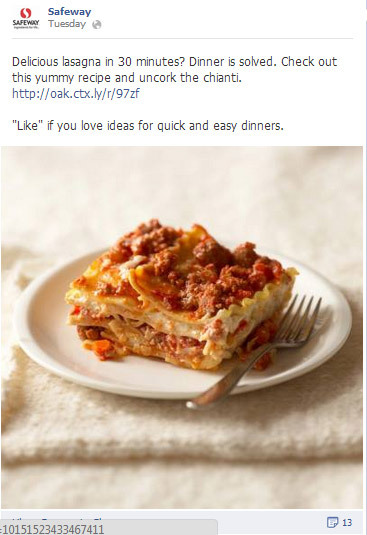 Like the ‘Share vs Like’ strategy, you can come up with your own competitions from scratch. Remember to choose eye-catching and appealing subjects for your competition. Which one do your children love? Which did you love as a kid? Which would you take on a picnic? Which would you take on a 3-day hike? Which is your favorite summer drink? Sometimes the simplest, most straightforward idea is the best. Just like with Twitter, in which asking for a retweet increases the chance of it being done by 23 times, being clear about what you want can yield some great rewards. 1. The picture : Honestly I think this post would have done fine even without the John Deere tractors spelling out ‘Like’, but a great image like this one will always help attract the eye. 2. 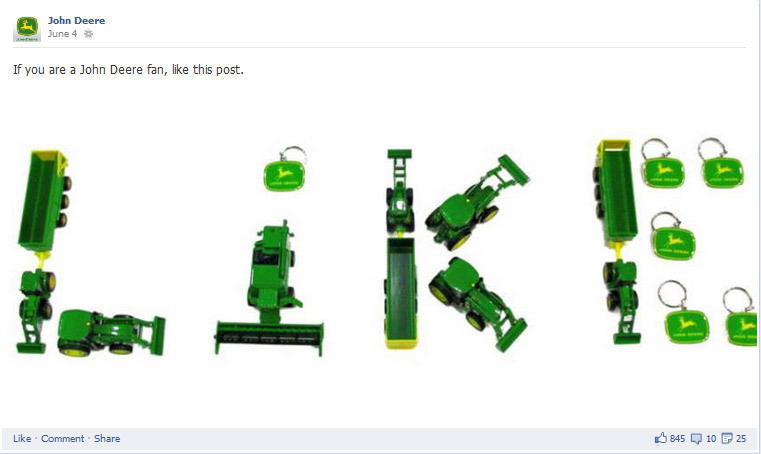 Knowing their audience: John Deere Fans are Fans on more than just Facebook. Like Ford and Chevy, or sports teams across the globe, John Deere recognizes their audience and takes advantage of their passion. 3. The Infrequency: John Deere does not use this strategy often, so when they do it’s new and bold again. Find a simple image that embodies your brand, whether that’s your logo or a picture more complicated is up to you. Test the image and use phrasing very similar to ‘If you’re a ___ Fan, like this post’ (rather than, for instance, ‘If you like us, like us…’. Remember this strategy does not have to be based around your brand as a whole. 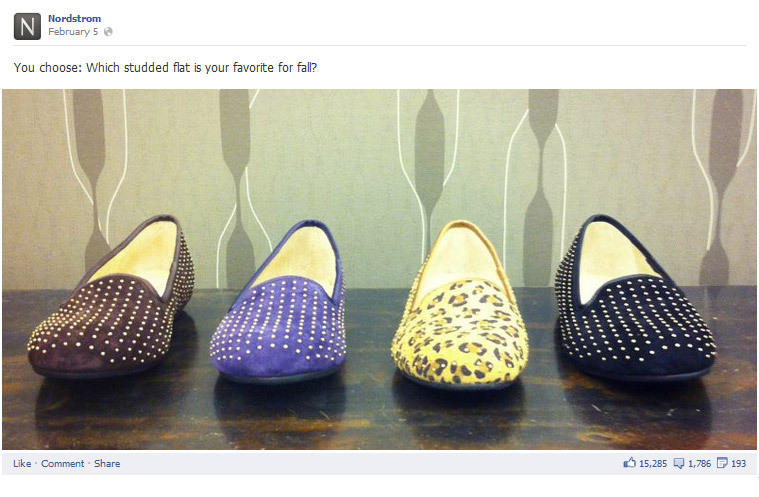 Try something more ambiguous as well: ‘If you’re a Fan of high heels on a Saturday night, like this post’. Tempt your Facebook Fans with a great tagline and then prompt them to the source of the development. 1. Exclusivity: Offering a ‘sneak peak’ at exclusive information is always a great way to engage the social media world. Social media users like feeling like they’re part of an exclusive club - offering them something like a sneak peek accomplishes this. 2. Cross-Channel Promotion: Encouraging Facebook users to ‘follow the conversation on Twitter’ cross-promotes your Twitter account and increases your social media reach. I would test ‘get involved in the conversation’, rather than simply ‘follow’. We’ve already established this Facebook user wants to be involved, so why not imply they have the chance to affect any ‘holidays’ related developments? Any upcoming development, product, or even new hire, can be used with the ‘sneak peek’ post. In fact, many social media gurus use these posts weeks in advance of a release date. Not only do they gain immediate followers, they also hype the product. Michael Stelzner over at Social Media Examiner has a great article on launching, and hyping, an upcoming product. 1. The Photo: Photos of food, as the single most popular pictures on social media, are an excellent way of attracting attention to a particular post. 2. Providing ‘quick and easy’ tips : Tips give readers and Fans a reason to keep coming back to your page. 3. Easy to like: Encouraging Fans to ‘like’ an easily accepted assertion is a simple and painless way for them to participate. 4. The Drive to their Website: Making the recipe available on Pinterest or their website drives traffic from Facebook and to those sites, increasing Safeway’s social media reach. Not just restaurants and grocery stores can use the ‘recipe link’ strategy. It’s also effective for ‘how-to’ articles, ‘top-10’s’ and webinars. It’s important, however, to find an appealing tagline and picture for the ‘offer something new’ strategy, so put some effort into this one as it’s not just gaining you Facebook likes, it’s also driving Fans to your website. Social media experts will tell you how important it is to know your audience. Nowhere is this more true than with Facebook posts. We’ll take a look at how varied companies like Intuit, Coca Cola and Converse focus their social media campaigns based on their audience. We’ll discuss the benefits and dangers of this strategy. By intentionally limiting your target audience you create exclusivity, drawing in those ‘select’ Fans who feel attached to your subject. Do this by providing a specific picture or hashtag, changing the tone and language you use, or talking about niche subject matter. 1. The Picture: Using a location-specific picture calls on a smaller, but targeted, audience. Everybody from San Francisco will stop scrolling when they see the iconic image of their home town. 2. Localized language: Using ‘the bay area’ and other, more localized terms, drills home their focus, and also appeals to the San Francisco Fan. 3. Niche subject matter: ‘Living Local’ is a subject that many people (but not everybody) are passionate about. Those who are will be attracted to this post. 2. Making it shorter: Because more than a third of Facebook users are using mobile devices, short posts (ideally around 225 characters) receive the most attention. Limiting your market intentionally, whether through sector, location or other demographics is a great way to increase the interest of those you’re reaching. Finding the right balance, though, is essential when you limit your audience. Make sure you’re not limiting yourself too much, or you’ll alienate your market. However, speak only to a niche market and they’ll respond in kind. Whether it’s an inspiring or funny quote, an easily-agreed-upon opinion, or an interesting fact, appealing to the Facebook world at large is a great way to garner some quick and easy likes. 2. Quotes: Statements like this can be incredibly effective, especially positive and thought-provoking ones like this as people share the thought on their own social media outlets, occasionally citing where they found it. 1. Simplicity : This is the simplest of all Facebook post strategies: a catchy, inspirational quote which appeals to a select audience. Figure out what your target audience is, and choose your quotes according to that group. 2. Balance: There has to be a balance between quotes and statements like this (which have no bearing on the product itself) and more traditional advertisements, product releases, and CSR notices. If you cover your profile in product-meaningless quotes you risk losing brand interest. 3. Relevance: This kind of Facebook post will not work for every organization, or not as much as it works for Coca Cola, who have essentially trademarked happiness. Try to make quotes relevant to your organization, projects, or goals. Facebook is a conversation and showcasing your Fan’s talent is a great way to create an exclusive community. Your Fans will respond more enthusiastically and more often if they feel you’re engaging with them as individuals. Speaking to their market : By creating groups and user-submitted contests focusing on music, art and other subcultures, Converse caters to their very specific clientele, also creating all-important exclusivity. The personal shoutout: Converse knows they have a niche market, and plays to that by personally thanking an individual for his or her picture. 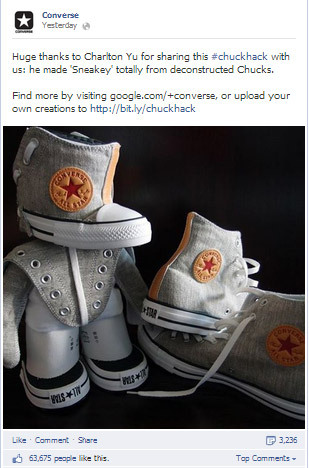 Involving multiple social media outlets: Converse encourages Fans to upload their own artwork and designs to Converse’s Google+ group - a great way to spread the love. Converse’s newsfeed is a great example of setting a tone and sticking with it. They know who their Fans are. Make sure you know your own target audience, and act accordingly. Do you represent a hardware store? Maybe avoid the tagline ‘which of these extension cords is your fave?! ’ It sounds simple, but you might be surprised at the return you get when your tone matches your audience. We all know a picture is worth a thousand words, and they’re a great and simple way to catch the eye of your Fans on Facebook. 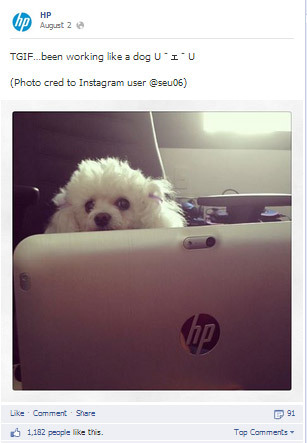 A quick and easy way to create some Facebook attention is to use a cute or appealing image. In many ways this strategy is similar to Coca-Cola’s ‘universal appeal’ technique. Simply find a picture of something adorable (could be anything!) and tie it into one of your products or business strategies. 1. Pictures of animals : Pictures of pets are consistently rated in the most popular photos on photo-sharing websites (behind only food, children, and food and children together…). 2. Universally appealing phrases : Phrases like ’ TGIF, ‘I hate Mondays’ and ‘Loving the sunshine’ will inevitably generate likes. 4. Giving credit to the photographer: Encouraging Fans and followers to take photos of your products and post them to their own profiles, especially if the photographer has a large following, will yield great results. Top Tip: If your organization has a large enough social media profile, giving photographers, designers, or contributors essentially free advertising on your Facebook or Twitter page will encourage others to do the same, resulting in an increase of traffic from them and their followers. Using real people is one of the best ways to halt a Facebook user mid-scroll. People expect to see celebrities and historical figures so a genuine face, with a story behind it, can be a powerful tool to drive participation. 1. Human interest stories: Significant events like birthdays and births are great for social media as people love hearing about and promoting the positive. 2. The Specifics: His name, the fact that he’s a veteran, and his age all help make this story a personal one, making a multi-national corporation seem approachable and resulting in increased Fan participation. 1. Take Advantage: Opportunities like this one don’t come along very often. So when they do, make sure you take advantage of them. Has one of your colleagues had triplets or a life event? Ask Facebook to join you in congratulating them! 2. Take pictures of your events: Do you have a weekend softball team or recent business barbecue? 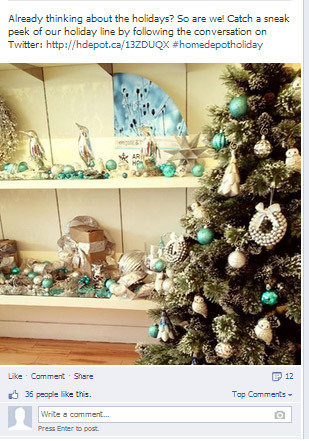 Personalizing your Facebook page, and posts, makes your business profile more approachable. Depending on your social media persona and tone, using a meme or humorous Ecard can be a great way to engage with your Fans. Used wisely they work much like Coca-Cola’s inspirational quote and HP’s adorable pet to encourage a casual ‘Like’ without much further engagement. You’re unlikely to drive much traffic to your website with this strategy, but you can definitely increase your Facebook presence. 1. Memes: Memes and Ecards can be effective attention grabbers, especially particularly random ones like the above. 2. Humor: A humorous statement, quote, or image can effectively communicate an organization’s social media ‘tone’ - something very much dependent on their target audience. 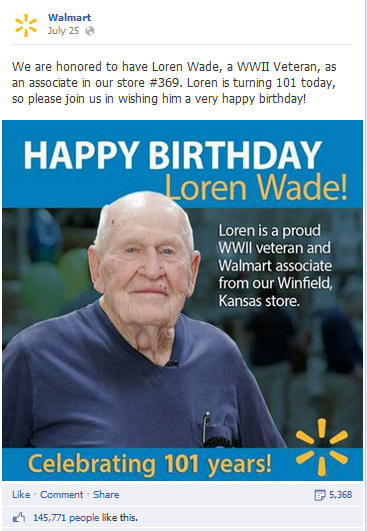 Playing with fire: Not every organization can ‘pull off’ a meme Facebook post, or should try. Converse, an organization whose target audience is young, hip and irreverent, makes this ironic and funny tone work. By no means, though, would this strategy work for any organization. Try reddit.com’s ‘sub-reddit’ /r/pics for pre-approved pictures. Get your own co-workers to pose for a photo at the weekend barbecue. Ask your Twitter, Pinterest and Instagram followers to get involved. Perhaps a contest for most adorable “baby+your-product” picture? Winner gets a prize, runners-up get used as Facebook ammunition! By prioritizing the editorial process and double-checking your work you can limit those little human errors that can make all the difference. But no matter how hard we try, the intricacies of social media can catch even the best of us out sometimes. Telus’ Facebook post looks great to begin with: a cute animal, making the offer exclusive by limiting the amount of time it’s available, and using multiple platforms to increase their promotional reach. This example really brings it home how important it is to check your links, and your posts as a whole, before making them live. I hope seeing some successful examples of Facebook posts has inspired you to create your own. Don’t forget that mixing and matching strategies can multiply results: remember to target your audience when you choose which photo you let ‘speak for itself’. What do you think? Do you have any Facebook post strategies you’ve found that bring great results? Please share your comments below. Looking to really drive Facebook engagement? Wishpond's Facebook Contest Apps make it easy to create sweepstakes, photo contests, Instagram hashtag contests & more.